The Tribune has reported that the Lynden Pindling International Airport will remain closed on Friday as stakeholders begin the clear up operation with a view to restoring operations on Saturday. 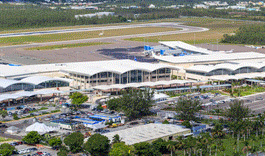 The Nassau Airport Development Company (NAD) said on Thursday night that staff are asked to report for work at 8am on Friday to begin the clear up and to "dress comfortably". NAD also asked all stakeholders of the airport - including airlines, airline services and others - to report at 8am. NAD asked the public to watch out for further messages regarding the re-opening.